New Products – Weber Screwdriver Systems – Automation Technology, Inc. The "Weber advantage" come from the unique design of the feed head system. Weber is one of the only manufacturers to incorporate a swiveling screw feed arm into the feed head. This technology reduces cycle time by an average of three to four seconds. 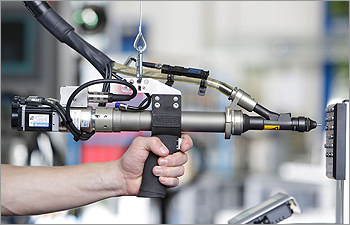 The Weber feed system increases the production capability by eliminating the time spent waiting on the next fastener to be delivered all the way from the feeder into the screwdriver. Faster cycle time means more output and less overall cost, when compared with other competitor’s systems.